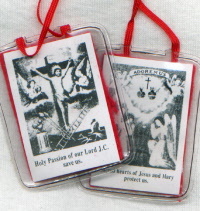 Origin: This scapular owes its origin to a series of apparitions of Jesus Christ to a Sister of Charity of Saint Vincent de Paul, Sister Apolline Andriveau, in 1846 in which He showed the sister a red scapular. Promises: To all who should wear it on every Friday a great increase of faith, hope, and charity. Church Approval: It was approved and indulgences were granted to its wearers by Pope Pius IX in 1897. Priests of the Mission (Lazarists) were given the faculty of blessing the scapular and investing the faithful with it; the Superior-General can communicate the faculty of blessing and investing with this scapular to other regular or secular priests.